Your home may boast a coveted open concept, spacious kitchen, and updated bathrooms unusual for its age; but if it doesn’t have curb appeal, today’s home buyers will be reticent to walk past the Welcome mat. Taking time to focus on the outside will not only promote buyer interest, decreasing the time frame it takes for you to sell your home, but it will also earn you a higher price and let you enjoy the view from now until you decide to sell. Here are some ways you can give your house a facelift, starting at the top. Roofs are metaphors for homes, as in “a roof over my head,” and for good reason: A leaky or decaying roof is not something that savvy buyers will be willing to overlook. 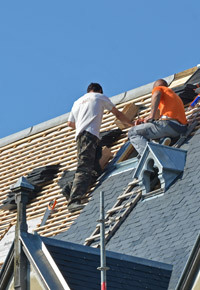 In addition, a problem roof can lead to other problems, such as rotting wood and mold. In the mean time, the damage can become irreparable, and everyone is sure to notice if your roof is not in tip-top shape. Since an appraiser will typically mark the value of your home down by the amount needed for roof repairs or replacement, it may seem irrelevant whether you get the work done before the appraisal. However, most people don’t want to buy a house, only to have a major expense like replacing a roof staring them in the face, so they may not even want to look at your house if it has a problem roof. The good news is that often a professional cleaning can be all your unsightly roof needs to look its best. Professional roof cleaners typically take a day to clean a 2,000 square foot roof, at a fairly affordable rate. If you do need your roof replaced, a new asphalt shingle roof will be no small expense, but may be a must in order to get the desired price and buyer attention which you need for your home. In addition to a clean and well-maintained roof, your house’s moisture management is highly dependent on its gutters and downspouts. 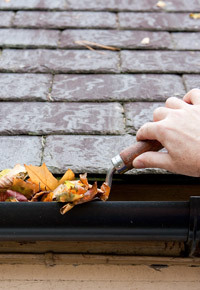 Gutters with plants growing out of them, leaves and dirt collecting in them, or rusty or rotting parts make potential buyers wary of moisture damage. Besides the red flags that such issues may put up in buyers’ minds, they aren’t very pretty. The optimal way to ensure your gutters remain clean and intact is to have seamless one-piece LeafGuard gutters installed. Downspouts should have well-sealed connectors and extensions at least 6 feet long in order to direct the water away from the home’s foundation. In addition, having a drainage system with pop-up emitters can increase both your home’s curb appeal and its attractiveness to environmentally conscious buyers. If you start with these top ways to increase your home’s curb appeal, you’ll be well on your way to protecting your asset and increasing the chances of its sale when that day comes. About D.R. Hartman Construction Inc.
D.R. Hartman Construction Inc. is a fully licensed and insured general contractor providing services in Maryland (Bethesda, Chevy Chase, Potomac, etc), ; Washington, D.C.; and Fairfax County, Virginia. Led by Don Hartman, DRHCI provides construction services for both residential and commercial projects. DRHCI does home remodeling and addition projects as well as prefabricated steel building construction and turn-key build-out renovations for offices, warehouses and retail stores. Contact D.R. Hartman Construction today to discuss your project; call (301) 926-9000 or submit this online contact form.